I happen to like my chocolate chip cookies a bit gooey in the middle, semi-soft on the outside, and hot from the oven when the chocolate is still hot so it oozes out when you bite into it. Yes, that’s the perfect cookie in my world! Grab a glass of milk for dunking and oh my, enjoy the 10 mins of bliss all to myself…. 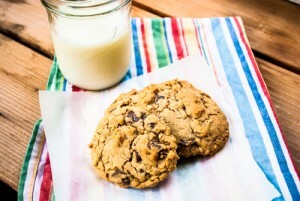 Why is it, when life has a few bumps, a cookie and glass of milk can make it all better? Strange how that is, maybe because it reminds us of our child hood memories. Ahhh to be 8, 9, or even 10 again! To only have to worry about where to play, what color of crayon to use, or which friend is your besty today! 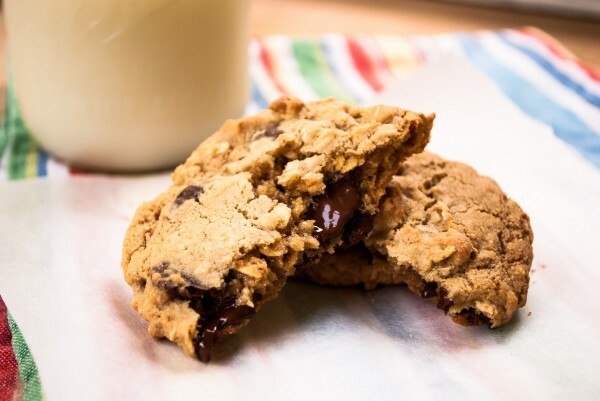 Well, we can’t go back in time and be a kid again, but we can whip up some gooey chocolate chip cookies with oatmeal, and pretend for at least 10 mins, that all is right in the world, and leave all our worries behind….even if for only 10 mins! A few of the ingredients needed to put a smile on that face. Hot from the oven, yum!!! Ready to indulge with a glass of milk, Hellooo childhood memories! 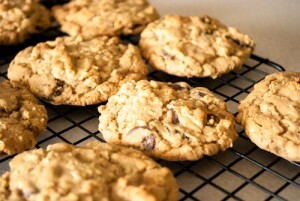 The perfect Chocolate chip cookie with a bit of oatmeal… Warning: you might eat them all! Melt butter in microwave and let cool. Mix in a medium bowl, vanilla, egg, sugar and butter until smooth. 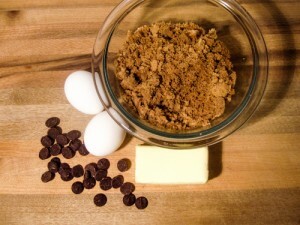 Add flour mix to sugar mix until combined, then add oats and chocolate chips. Drop onto parchment lined cookie sheet with a spoon. Bake for 10 mins at 350 degrees. This recipe yields about 12 cookies depending on your size of cookie. Doubles easily for a few batches. You can also use your favorite gluten free flour instead of regular flour to make these gluten free. I use Bob’s Red Mill.